Sale? Restructure? MBOs? After Sorrell, what next for WPP's £1.2bn PR business? Rumours that WPP is primed for an imminent sale of its PR assets after the departure of Sir Martin Sorrell may be wide of the mark, but their long-term future, and much else about the group, remains uncertain. PRWeek considers the options open to Sir Martin's successor. Analysts wasted little time making bold claims about WPP’s future after last Saturday’s news that Sir Martin Sorrell, its leader and architect of growth for 33 years, had suddenly quit. The argument goes that Sorrell was "the glue" binding much of WPP together; the marcoms Caesar uniting a patchwork empire of disparate, sometimes competing, entities; the huge spider at the centre of a complex web of his own lengthy construction. Alex de Groote, media analyst at Cenkos Securities, described the question of Sorrell’s successor as a "red herring," because his departure means shareholders can do what they always wanted to do: break up the company. Its constituent parts, especially the health and digital divisions, are worth far more than WPP’s share price, de Groote said, which has fallen by more than 40 per cent from its February 2017 peak. Moreover, a breakup of WPP would likely trigger moves by shareholders at rivals such as Omnicom, Interpublic and Publicis, de Groote said. Indeed he predicted that all the marcoms would be broken up within the next 12 to 18 months. Another analyst, Ian Whittaker at Liberum, said there was a "significant possibility" that WPP would now sell its market research unit Kantar "and possibly PR". He argued the margins in the PR business – which accounted for 7.7 per cent of revenue in 2017/2018 - are lower than the group average, at 8.1 per cent and 14.9 per cent, respectively, and there were "few revenue synergies between PR assets and the other WPP assets". But these doomsday predictions should be met with some scepticism. The official line from WPP itself is unequivocal. "Media and analyst speculation about selling the PR businesses looks extremely wide of the mark. It’s very much business as usual," says Bobby Morse, managing partner at WPP financial and corporate shop Buchanan. Another senior WPP source tells PRWeek "there is no talk of any changes to the PR businesses at all. If there were to be any break up, it’s about Kantar - the Kantar business has been losing money." Morse – whose colleague, Buchanan executive chair Richard Oldworth, is leading the comms operation around Sorrell’s departure and the successor search – also points to the timing question. There is currently no timetable for appointing Sorrell’s successor. In the meantime, day-to-day running of the group is led by new joint COOs Mark Read (CEO of Wunderman and WPP Digital) and Andrew Scott (WPP corporate development director and COO of WPP Europe), with chairman Roberto Quarta becoming executive chair. WPP has admitted that it has appointed a recruitment consultant, suggesting that a thorough, and presumably lengthy, search is on the cards, with internal and external candidates in the frame. One senior agency figure from outside WPP tells PRWeek: "Nothing’s going to happen until there’s a new chief executive because a new chief executive has to ‘own’ what they do, and they will have a minimum of three months to work out what to do. So you’re talking at the very least about six to nine months." The next question is even if WPP’s PR interests were for sale, who the potential buyers would be. Private equity seems like an unlikely route for now. As one agency boss argues, private equity firms typically buy at a multiple of around six to seven times earnings, whereas WPP shareholders will be unwilling to sell below the current valuation of 10 times earnings. The unspectacular recent performance of WPP’s PR assets is a firm deterrent. Revenue in WPP’s PR and public affairs arm rose just 1.7 per cent in its most recent financial year (see graphic below for the performance of several individual PR agencies, taken from PRWeek’s Agency Business Report). Rival networks have also reported mediocre trading recently. Omnicom, the FleishmanHillard, Ketchum and Porter Novelli owner, mustered organic revenue growth of just 0.3 per cent in 2017. Revenue at Interpublic Group’s Constituency Management Group, which includes Weber Shandwick and Golin, was flat last year. "If you’re PE, why would you want to buy PR?," says the source. "They buy distress. WPP is not distress; it’s just not growing. PR has not done well in these big holding companies for the last five years. When you’re talking about one per cent up or one per cent down, who cares? Investors want to see three, five, six per cent growth. In the UK market alone, there have been a number of private companies coming out of private equity that haven’t found a buyer. WPP’s assets are quite good, but still nobody’s going to buy them." A trade sale also seems unlikely at present. As one experienced big agency boss puts it: "It’s not like Edelman’s a buyer. It’s not like Interpublic Group is a buyer. It’s not like Omnicom’s a buyer. 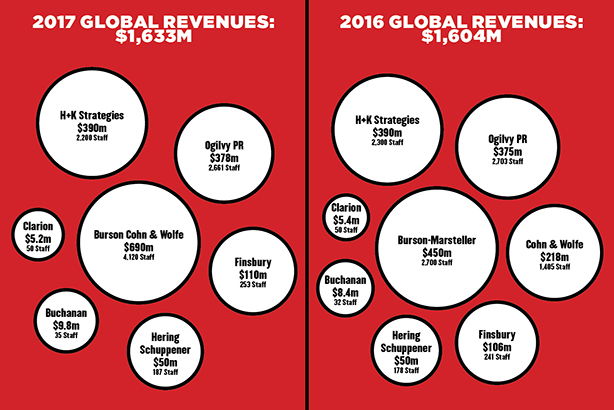 It’s not like Havas is a buyer, or could afford it. I think they all wish they didn’t have PR, except for Edelman." Tim Dyson, CEO of holding company Next 15, is also cool on the prospect of any imminent sale. "The talk of WPP being broken up is being driven by analysts looking to unlock value, but I struggle to see why WPP would actually pursue that strategy. The assets they’d want to sell are the low-growth, ageing businesses and I can’t see them being easily bought." For Dyson it’s "more realistic" that a management consultancy such as Accenture, which snapped up integrated creative group Karmarama in 2016, could swoop for WPP assets, post-Sorrell. "Without the ego challenges this type of big deal usually faces, I could see the WPP board being willing to enter into talks. If that were to happen Martin could well have been the catalyst for a new 'one-stop shop' form of marketing, one that also embraces the consulting on the very business model that you then take to market." Unlike other marcomms holding companies, Accenture – which has a market capitalisation above $98bn, against WPP’s of around $20bn – has the scale to mount a feasible bid for the business. But WPP is no Karmarama, and taking on such a behemoth as WPP at a time of industry and boardroom flux is probably a step too far, even for a cash-rich management consultancy. Whether one would want to pick off individual parts of WPP, however, is another question. Assuming the PR business stays with WPP, there is even a question as to whether it would make the major structural changes that everyone is presuming. Some say this is unlikely, given the fact major rationalisation of WPP’s PR agencies has already occurred - most notably with the merger of Burson-Marsteller and Cohn & Wolfe in March, and the integration of Ogilvy PR into the wider Ogilvy brand. One WPP source puts it bluntly: "Why would anyone f**k around with Finsbury at the moment, with everything else going on? There are much bigger things to deal with. From the PR point of view, I think it will be business as usual for the foreseeable future. I don’t think there will be any radical changes." And yet, the new CEO will have an opportunity to reassess Sorrell’s philosophy of ‘horizontality’ – where WPP agencies of different disciplines work together as ‘one-stop shops’ for clients, exemplified by work with the likes of BA, Ford and Colgate. There is the possibility instead that WPP will take a closer look at how rival holding companies have been integrating their PR businesses more closely. Omnicom’s decision in 2016 to create Omnicom Public Relations Group, uniting its 12-strong PR agency portfolio under Karen van Bergen, has arguably given more cohesion and identity to the holding company’s PR businesses than the more disparate agencies in WPP’s PR and Public Affairs division. Donna Imperato, the highly rated CEO of the newly merged Burson Cohn & Wolfe, would be an obvious candidate for a Karen van Bergen-type role at WPP. "Martin’s departure could well start a game of musical chairs as key execs get moved around and their key lieutenants follow," says Dyson. "In turn that could see major accounts also go through a shuffle. In short, it could be a very busy year in the marketing world." Or WPP could take a look at the example of Publicis, which in late 2015 placed PR agency MSLGroup and other creative assets into Publicis Communications – one of four new units as part of the group’s "Power of One" approach. Donna Imperato, CEO, Burson Cohn & Wolfe: Imperato oversaw consistent growth at Cohn & Wolfe in recent years, winning the favour of Sir Martin, as confirmed by assuming control of the newly-merged BCW. If a new WPP CEO wanted to create a pan-PR group in the mold of Omnicom or Publicis, Imperato would be an obvious choice to lead it. Don Baer, chair, Burson Cohn & Wolfe: Despite have led the bigger part of BCW before its merger, former Burson boss Baer plays second fiddle to Imperato in the new entity. His role is due to be more client-focused. Jack Martin, global chair CEO, H+K Strategies: In post since late 2011, Martin hailed 2016 as "one of the best years we've had for quite some time" in the 2017 PRWeek Agency Business Report, thanks to acquisitions and the creation of a London creative hub. Stuart Smith, global CEO of Ogilvy PR: When the global integration of Ogilvy was announced last year, the firm said Smith would retain responsibility for the PR portion of the group. It remains to be seen exactly how this will pan out for Smith - meanwhile he has duties as PR Lions jury chair at Cannes to think about. Roland Rudd, founder and chair, Finsbury: A big beast of financial PR, Rudd oversees an empire that had traditionally acted almost independently from the rest of WPP - until forming alliances with Germany's Hering Schuppener in 2016 and New York's Glover Park the next year. Could the trio spin off into a new global network, with Rudd at the helm? As Whittaker points out, WPP has underperformed its peers on the stock market since the start of the year. As of Monday (16 April), its share price is down 11 per cent in the year to date compared to -1.4 per cent for Publicis, -1.3 per cent for Omnicom, and +15.7 per cent for Interpublic. The new WPP leadership will doubtless want to learn from the firm’s closest competitors. (At the time of writing WPP’s share price had begun, slowly, to recover the losses). Another senior, non-WPP agency figure predicts the company may take a completely different approach to integration. "You might see more of what I call P&L integration: the brands remain the same, and the P&L ownership, the bonus structure, would be shared amongst the principles. "Does Hill + Knowlton integrate within [ad agency] J Walter Thompson? That could be an option. Burson Cohn & Wolfe would be a wildcard, who knows? Does it become part of Grey, or does it stay alone because of its size?" Certainly, WPP’s integration of Ogilvy is a recent example of how a PR agency can be fully integrated within another marcoms consultancy (admittedly, this is an unusual case, given the common Ogilvy brand). PRWeek believes management buyouts in some of WPP’s PR businesses are another intriguing possibility. It is conceivable that specialist corporate powerbrokers and entrepreneurs such as Finsbury CEO Roland Rudd could look at funding options to spin off the mainstay financial agency, perhaps in collaboration with Finsbury’s close partners, German agency Hering Schuppener and US consultancy Glover Park Group. There is precedent for even large agencies moving in and out of holding company ownership. Freuds has been part of both Omnicom and Publicis during its 33-year history, and has thrived for several years as an independent. The truth is that it could be several weeks, even months or years, before the future of WPP and its PR operations becomes clear. PRWeek will continue to update the industry on these developments. In the meantime, amid all the speculation about sales and restructures, one should not lose sight of the fact that tens of thousands of talented comms professionals work in WPP’s PR agencies – and that their futures may depend on the decisions of one individual whose identity, for the time being, remains a mystery.